Responding to the news that it's all go for the first performance of Sewing With The Rain... a mixture of panic and joy. 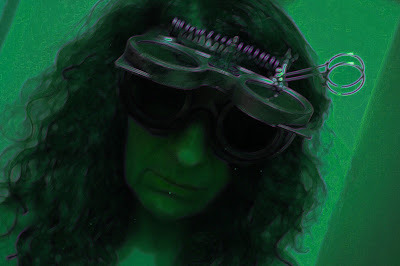 Also, a chance to try out my goggles for scenes in the sulphurous swamp. So far, it is myself and the marvellous and wonderful Késia Decoté... and space for more....watch this blog for developments . A tale, about what is worth doing and what is worth having, where the beautiful things created by her hands sometimes seem tenuous. Can any significant good come from making fragile precious things?